This page serves as a landing page to compile blog posts and resources for specific research and projects undertaken and published on this blog site. This section complies posts relating to my Field Notes Blog, part of my experience with the Coursera Animal Behavior MOOC offered by The University of Melbourne. I’ve chosen to watch the brown bears of Katmai National Park, in Alaska, in lieu of something more close to home, in part because of my interest in large mammal wildlife, but also because just as I was about to begin this assignment, I happened to receive an email from World Wildlife Fund that included a piece on “4 Places to Watch Wild Bears”, of which one was Katmai. After a brief investigation, I learned that summertime is one of the peak bear-watching seasons, and that the National Parks Service offers a series of live webcams at Katmai including a couple of the most popular places where the brown bears are known to fish along the Brooks River. 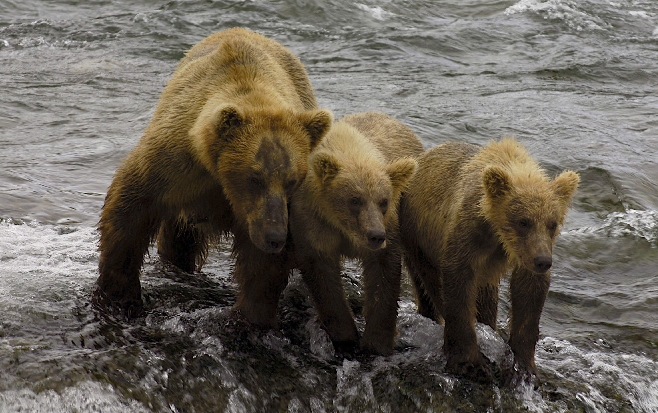 On this page you will find a collection of blog posts related to my “field observations” of the brown bears of Katmai, done from afar thanks to the availability of live webcams. This study began as an independent study course for the summer of 2011, designed to be an exploration of the dominant qualitative data-gathering methods most often employed by the major international humanitarian aid organizations, under the supervision of Adjunct Assistant Professor Nathan Morrow. The study was conducted by me, Jessica H. Ports, a PhD student at Tulane University’s Payson Center for International Development. It is my sincere hope that this study and the resources complied here will be useful for others in the field of international development and humanitarian aid studies, as a resource of best practices in qualitative research. I welcome and look forward to feedback – please let me know what you think and feel free to provide suggestions for additional resources and/or research! This study was originally designed to develop in-depth knowledge of current qualitative research methods in the international development and humanitarian response fields, including an initial overview of the prevalent data-gathering techniques for qualitative research (including case study, group discussions, participatory techniques, key informant interviews, and content analysis). This study has grown into a larger and more exciting project than originally anticipated, and as such I have created a series of resources based on my findings, including an index of sources, a series compilations of methodology and utilization of a variety of qualitative methods, a discussion of prescribed methods vs. methods employed by the organizations studied, some best practices, gap analysis, and proposal for the minimum tools and training to be employed in each phase of the humanitarian program cycle. The intended focus is on applied qualitative research conducted by some of the major international humanitarian agencies, with an eye toward creating a comprehensive resource of methodology and best practices, and to understand how and when the various qualitative methods are prescribed and utilized by these agencies. I chose a total of ten organizations & agencies who are major players in the international humanitarian aid field. ALNAP’s report on The State of the Humanitarian System (2010) mentions a group of the six largest INGO federations/organizations as CARE, Catholic Relief Services (CRS), Médecins San Frontières (MSF), Oxfam, Save the Children, and World Vision International. Together, in 2008 these “had an estimated combined overseas operating expenditure in excess of $4 billion, of which $1.7 billion was allocated to humanitarian programming.” (pgs. 19-20) I took this list of six organizations as my starting point. 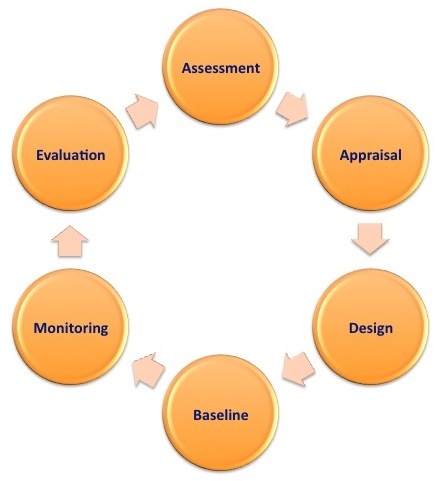 I based my initial investigation on the stages of the program/project cycle: Assessment, Appraisal, Design, Baseline, Monitoring & Evaluation. I attempted to determine which qualitative methods were either prescribed or actually employed by each of these selected organizations in each stage of the cycle. Berg, B. (2008) Qualitative Research Methods for the Social Sciences (7th Edition). Boston, MA: Allyn & Bacon. Bernard, H. R. (2006) Research Methods in Anthropology: Qualitative and Quantitative Approaches (4th Edition). Lanham, MD: AltaMira Press. Perecman, E. & Curran, S., eds. (2006) A Handbook for Social Science Field Research: Essays & Bibliographic Sources on Research Design and Methods. London, UK: SAGE Publications. This post pulls together some conclusions, suggests possible reasons contributing to the findings, and describes best practices used by the organizations in this study. It also includes a selection of documents which serve as the most outstanding resources for describing methods and techniques for qualitative data collection. See Discussion & Conclusions. A complete index of all organization and reference documents in this study is available. See: Index of Reviewed Sources and Additional Sources & References. I was fortunate to be selected as one of two representatives from the American Red Cross to attend an annual two-week training in Poland hosted by the International Committee of the Red Cross, an in-depth exploration of International Humanitarian Law (IHL). These posts are a small look at some of the people I was lucky enough to meet and some of the amazing experiences we had over the two weeks of the course. TechChange is an outstanding group, offering a number of helpful courses relating to the application of technology for social good. I have taken a number of their courses, and highly recommend them! As part of my involvement with a few of these courses I’ve done some interviews with tech experts here at Tulane University, and posted them here on my own blog as well as on the TechChange blog used for the course. They cover a range of tech solutions and ideas used for emergencies, public health, and disaster response.